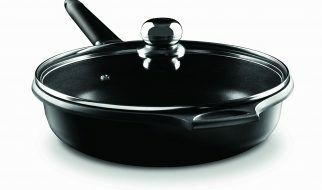 Routinely billing its wares as ‘professional grade,’ Chef’s Star has built up quite a reputation as a solid source of high grade cookware that’s built with industrial specifications and durability but geared toward home chefs. This industrial-level focus can easily be seen in this Chef’s Star set. From the type of stainless steel chosen for this cookware to its aluminum bonded bottom, everything about these pots and pans indicate heavy duty use, durability, and long term value. Its metal composition and design also makes it an all-around choice for optimal heating and cooking regardless of the type of cooktop you’re using. This mix of durability and versatility is just one of the many reasons the Chef’s Star Professional Grade Stainless Steel 17 Piece Pots & Pans Set is worth looking into. 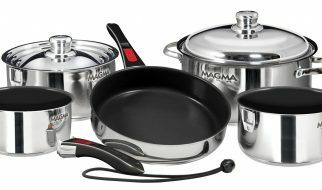 In this review, we’ll analyze this cookware set based on the following criteria: special features, total optimal value, versatility of operation, handling, cleanup ease, and overall durability. Made from 18/8 commercial grade type of stainless steel, it is quite obvious this set is meant for serious heavy use. The grade of steel used in this set takes the durability of this cookware set to a whole other level. We’re talking about the ability to take a beating and keep on going. Given its hardy construction, complete with riveted handles for extra durability, it is quite obvious that this set is intended to take on the punishment of metal and other utensils and keep going. Even the anti-slip feature of its handles reveal an intended use that involves lots of heavy ingredients and handling. Numbering a total of 17 pieces, this package is actually quite affordable if you divide its price based on the number of cookware pieces it contains. Paired up with its imposing commercial grade steel selection as well as heavy duty construction, this cookware also brings lots of versatility to the table since it can perform equally well across a wide range of cooktop surfaces. Based on this model’s material composition and overall design, buyers are in for some long term use without having to worry about cooktop compatibility. Even little touches like the anti-slip satin finish of its ergonomically shaped handles indicate an attention to detail that maximizes user control. Given its bonded aluminum heating plate construction, users can be assured of fast and evenly distributed inductive heating. All the factors above combine to deliver solid long term value. One of the most annoying experiences you can ever have as a home cook is to rifle through your cupboards because your trusty “go to” pan doesn’t have enough iron content to be useable on that new induction cooktop you just bought to upgrade your kitchen range. 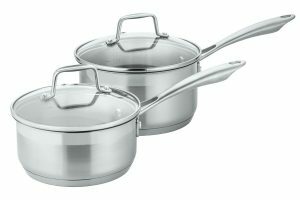 You won’t have this issue with the Chef’s Star Professional Grade Stainless Steel 17 Piece Pots & Pans Set. First of all, its bonded aluminum heating disk bottom ensures the proper ferrous content to produce optimal inductive heat. Not only would this pan do well on induction cooktops, it also does great on traditional flame and electric heat sources as well as glass and infrared surfaces. Since this set has a large number of items, you are assured of the right cookware for the right job. If you need to fry something, there’s two sizes of fry pans to choose from. If you’re looking to whip up some sauces, there are two sizes of sauce pans. This wide selection of cookware types as well as size makes for economical cooking that ensures you will cook your dishes under optimal conditions. You don’t have to fumble around with the handles of the pieces in this cookware set. They have ergonomically designed handles that make it easier to move them from place to place on your cooktop of kitchentop. Each piece is relatively light so you aren’t slowed down when you’re quickly stirring and moving different pieces of cookware at the same time. Indeed, this set is so easy to use you can use the pieces in an oven (up to 500 degrees Fahrenheit) or in a freezer. One look at the interior of the cookware in this set quickly reveals that this is not a non-stick cookware package. While you get a lot of durability, versatility, and ease of use with this package, it is not without its shortcomings. It does not have a non-stick surface. Accordingly, clean up can be a bit hard especially if you let spills dry up on its outer walls or you let your pans dry out after cooking. To avoid the hassle of having to scrub furiously for a long time just to partially restore some of this cookware’s lost glory, you might want to try and avoid problems from happening in the first place. By simply choosing to be proactive, you can make things so much easier on yourself when it comes to cleanup time. How can you be proactive? Well, you can quickly put the cookware in the dishwasher right after use. You can also opt to soak pots and pans that have dried sauce or dried spills on their outside walls. You need to wait long enough to ensure the dried spills or spots have softened enough for them to be wiped away by a sponge and rinsed. Thanks to its solid stainless steel construction involving commercial grade material, you can be assured that this set’s pieces can last for quite some time. You can maximize the value you get from this set by simply choosing to use this set continuously over the long haul. The more you use the set, the cheaper your per use cost will be. Of course, the most crucial element to this analysis is the product’s ability to last a long time. Thankfully, given this set’s great overall construction and choice of materials, you probably wouldn’t have to worry about durability. If you’re looking for a great combination of durability, excellent cooking capabilities, and versatility, you can’t go wrong with this model.